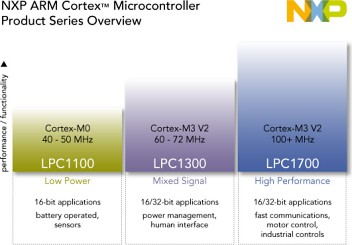 The LPC1000-family from NXP is based on a 32-bit Cortex core from ARM and is clocked up to 150MHz. The LPC11xx-series is based on Cortex-M0, the LPC13xx (up to 72MHz), 17xx and 18xx (up to 150MHz) on Cortex-M3. Meanwhile this cores are available (even for a very low quantity) at a comparable price of current 8-bit controller as ATMega. 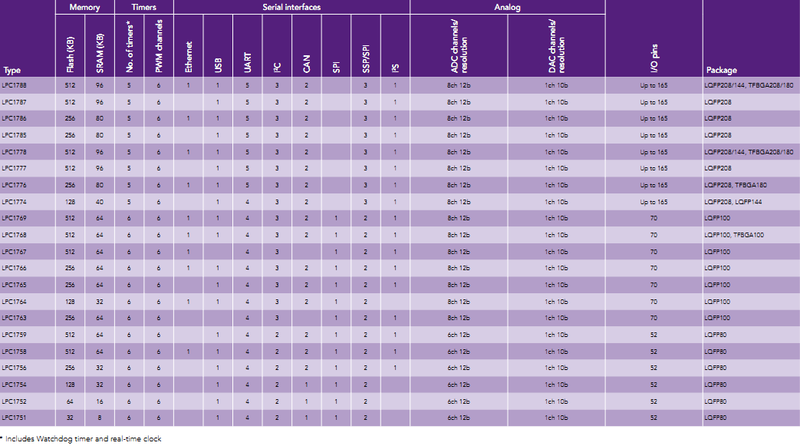 Please find a complete list here "The ARM selection guide" (PDF) from NXP (page 2f). LPC1100L series in addition to LPC1100: • Power Profile with lower power consumption in Active- und Sleep-mode, • Interne pull-ups auf VDD level, • programmable pseudo open-drain mode for GPIO pins, • WWDT with Clock Source Lock. LPC11C00 Serie in addition to LPC1100: • CAN controller, • On-chip CAN driver, • On-chip CAN Transceiver (LPC11C2x), • WDT (not windowed) with Clock Source Lock . The Low Power LPC12xx-series (3,3V) is according to NXP (Sep2011) a Cortex-M0 with 32 to 128kB Flash, a 45 CoreMark™ Benchmark-Score at 30MHz, 2 to 8kB SRAM, and an internal 1% accurate 12MHz Oscillator. Features: fMAX or 30MHz, 1 10-Bit ADC with 8 channel, 2 Comparator, 2 UARTs, 1 SSP/SPI, 1 I2C, DMA Controller, CRC Engine, 1 32-Bit, 5 Timer (16- and 32-Bit, + RTC), 13 PWM channels, up to 55 GPIOs. The LPC13xx-Serie (3,3V) devices are ARM Cortex-M3-based microcontrollers for embedded applications featuring a high level of integration and low power consumption and provides 8..32k Flash, 2..8k SRAM, 5 Timer (with WD), 11 PWM, 1 UART, 1IIC, 1USB, 1..2 SPI, one 8-channel /10Bit AD and a clock of up to 72MHz in a LQFP 48 housing. The LPC17xx-series provides moch mor periperal in a LQFP80 and a LQFP100 package. 32..512k Flash, 8..64k SRAM, 6 Timer (with WD), 6 add. PWM-units, Ethernet, mostly USB, 4 UART, 2..3IIC, 1..2 CAN, 1 SPI, 2 SSP/SPI one 6..8-channel/12bit ADC, one 10Bit DAC, Motor-Control-Units, one Encoder-Input at a clock frequenca of 100MHz(120MHz) and much more. TheLPC18xx-series is THE "High-Performance" Controller-Family with Cortex-M3. With a clock frequency up to 150MHz, a dual bank Flash up to 1MB, a large on-chip SRAM up to 200KB, additional peripherie eg. SPI Flash Interface (SPIFI) und State Configurable Timer (SCT), 2x High Speed USB (On-Chip HS PHY) and a MPU. From NXP a very cheap kit (app. 25€ for USB-JTAG Programmer and Debugger) is available eg. Watterott. Please see the dokumentation from NXP LPCXpresso-Entwicklungskit (PDF). A "free of change" environment is available here. code-red: The Eclips based environment is open up to 8k after installation and up to 128kB after a FREE registration. for Linux click here. 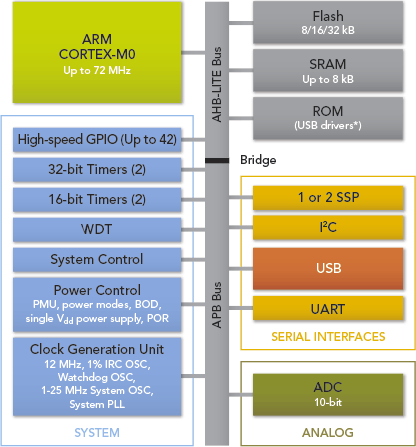 ARM Cortex-M0 processor, running at frequencies of up to 50 MHz. ARM Cortex-M0 built-in Nested Vectored Interrupt Controller (NVIC). 32 kB (LPC1114/LPC11C14), 24 kB (LPC1113), 16 kB (LPC1112/LPC11C12), or 8 kB (LPC1111) on-chip flash programming memory. 8 kB, 4 kB, or 2 kB SRAM. Up to 42 General Purpose I/O (GPIO) pins with configurable pull-up/pull-down resistors. Number of GPIO pins is reduced for smaller packages and LPC11C22/C24. GPIO pins can be used as edge and level sensitive interrupt sources. High-current output driver (20 mA) on one pin. High-current sink drivers (20 mA) on two I2C-bus pins in Fast-mode Plus. Four general purpose timers/counters with a total of four capture inputs and up to 13 match outputs. UART with fractional baud rate generation, internal FIFO, and RS-485 support. Two SPI controllers with SSP features and with FIFO and multi-protocol capabilities (second SPI on LQFP48 and PLCC44 packages only). I2C-bus interface supporting full I2C-bus specification and Fast-mode Plus with a data rate of 1 Mbit/s with multiple address recognition and monitor mode. C_CAN controller (LPC11Cxx only). On-chip CAN and CANopen drivers included. On-chip, high-speed CAN transceiver (parts LPC11C22/C24 only). 12 MHz internal RC oscillator trimmed to 1% accuracy that can optionally be used as a system clock. PLL allows CPU operation up to the maximum CPU rate without the need for a high-frequency crystal. May be run from the system oscillator or the internal RC oscillator. Clock output function with divider that can reflect the system oscillator clock, IRC clock, CPU clock, and the Watchdog clock. Integrated PMU (Power Management Unit) to minimize power consumption during Sleep, Deep-sleep, and Deep power-down modes. Three reduced power modes: Sleep, Deep-sleep, and Deep power-down. Processor wake-up from Deep-sleep mode via a dedicated start logic using up to 13 of the functional pins. Single 3.3 V power supply (1.8 V to 3.6 V). Available as 48-pin LQFP package, 33-pin HVQFN package, and 44-pin PLCC package. ARM Cortex-M0 processor, running at frequencies of up to 45 MHz (one wait state from flash) or 30 MHz (zero wait states from flash). The LPC122x have a high score of over 45 in CoreMark CPU performance benchmark testing, equivalent to 1.51/MHz. Up to 8 kB SRAM. Up to 128 kB on-chip flash programming memory. Includes ROM-based 32-bit integer division routines. 12 MHz Internal RC (IRC) oscillator trimmed to 1 % accuracy that can optionally be used as a system clock. Clock output function with divider that can reflect the system oscillator clock, IRC clock, main clock, and Watchdog clock. Micro DMA controller with 21 channels. Two UARTs with fractional baud rate generation and internal FIFO. One UART with RS-485 and modem support and one standard UART with IrDA. SSP/SPI controller with FIFO and multi-protocol capabilities. I2C-bus interface supporting full I2C-bus specification and Fast-mode Plus with a data rate of 1 Mbit/s with multiple address recognition and monitor mode. I2C-bus pins have programmable glitch filter. Up to 55 General Purpose I/O (GPIO) pins with programmable pull-up resistor, open-drain mode, programmable digital input glitch filter, and programmable input inverter. Programmable output drive on all GPIO pins. Four pins support high-current output drivers. All GPIO pins can be used as edge and level sensitive interrupt sources. Four general purpose counter/timers with four capture inputs and four match outputs (32-bit timers) or two capture inputs and two match outputs (16-bit timers). Two highly flexible analog comparators. Comparator outputs can be programmed to trigger a timer match signal or can be used to emulate 555 timer behavior. Processor wake-up from Deep-sleep mode via start logic using 12 port pins. 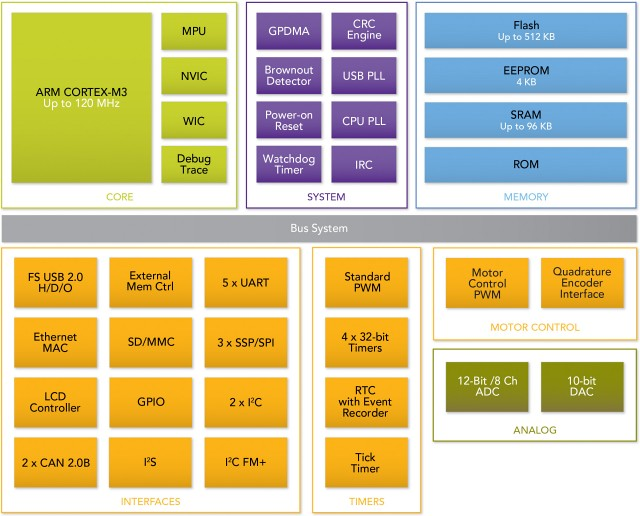 Processor wake-up from Deep-power down and Deep-sleep modes via the RTC. Brownout detect with three separate thresholds each for interrupt and forced reset. Integrated PMU (Power Management Unit). Available as 64-pin and 48-pin LQFP package. SSP controller with FIFO and multi-protocol capabilities. Additional SSP controller on LPC1313FBD48/01. Serial Wire Debug and Serial Wire Trace port. Clock output function with divider that can reflect the system oscillator clock, IRC clock, CPU clock, or the watchdog clock. Processor wake-up from Deep-sleep mode via a dedicated start logic using up to 40 of the functional pins. Brownout detect with four separate thresholds for interrupt and one thresholds for forced reset. 12 MHz internal RC oscillator trimmed to 1 % accuracy over the entire temperature and voltage range that can optionally be used as a system clock. Programmable watchdog oscillator with a frequency range of 7.8 kHz to 1.8 MHz. System PLL allows CPU operation up to the maximum CPU rate without the need for a high-frequency crystal. May be run from the system oscillator or the internal RC oscillator. Code Read Protection (CRP) with different security levels. Available as 48-pin LQFP package and 33-pin HVQFN package. A Memory Protection Unit (MPU) supporting eight regions is included. 128 kB on-chip flash program memory with In-System Programming (ISP) and In-Application Programming (IAP) capabilities. 32 kB of SRAM on the CPU with local code/data bus for high-performance CPU access. 52 General Purpose I/O (GPIO) pins Any pin of ports 0 and 2 can be used to generate an interrupt. Four general purpose timers/counters, with a total of eight capture inputs and ten compare outputs. One standard PWM/timer block with external count input. Real-Time Clock (RTC) with a separate power domain including 20 bytes of battery-powered backup registers, An RTC interrupt can wake up the CPU from any reduced power mode. Standard JTAG test/debug interface as well as Serial Wire Debug and Serial Wire Trace Port options. Single 3.3 V power supply (2.4 V to 3.6 V). Four external interrupt inputs configurable as edge/level sensitive. All pins on PORT0 and PORT2 can be used as edge sensitive interrupt sources. Each peripheral has its own clock divider for further power savings. 4 MHz internal RC oscillator trimmed to 1% accuracy that can optionally be used as a system clock. An on-chip PLL allows CPU operation up to the maximum CPU rate without the need for a high-frequency crystal. May be run from the main oscillator, the internal RC oscillator, or the RTC oscillator. Available as 80-pin LQFP (12 x 12 x 1.4 mm) packages. ARM Cortex-M3 processor, running at frequencies of up to 150 MHz. Up to 200 kB SRAM total for code and data use. Two 32 kB SRAM blocks with separate bus access. Both SRAM blocks can be powered down individually. 32-bit One-Time Programmable (OTP) memory for general-purpose customer use. Up to 1 MB total dual bank flash memory with flash accelerator. Up to 136 kB SRAM for code and data use. 32 kB ROM containing boot code and on-chip software drivers. 12 MHz internal RC oscillator trimmed to 1 % accuracy. Quad SPI Flash Interface (SPIFI) with four lanes and data rates of up to 40 MB per second total. One High-speed USB 2.0 Host/Device/OTG interface with DMA support and on-chip PHY. Four 550 UARTs with DMA support: one UART with full modem interface; one UART with IrDA interface; three USARTs support synchronous mode and a smart card interface conforming to ISO7816 specification. One Fast-mode Plus I2C-bus interface with monitor mode and with open-drain I/O pins conforming to the full I2C-bus specification. Supports data rates of up to 1 Mbit/s. One standard I2C-bus interface with monitor mode and standard I/O pins. Two I2S interfaces with DMA support, each with one input and one output. LCD controller with DMA support and a programmable display resolution of up to 1024H x 768V. Supports monochrome and color STN panels and TFT color panels; supports 1/2/4/8 bpp CLUT and 16/24-bit direct pixel mapping. Up to 80 General-Purpose Input/Output (GPIO) pins with configurable pull-up/pull-down resistors and open-drain modes. Two 10-bit ADCs with DMA support and a data conversion rate of 400 kSamples/s. Hardware-based AES security engine programmable through an on-chip API. Two 128-bit secure OTP memories for AES key storage and customer use. Processor wake-up from Sleep mode via wake-up interrupts from various eripherals. Available as 100-pin, 144-pin, and 208-pin LQFP packages and as 100-pin, 180-pin, and 256-pin LBGA packages. Red Suite 4 NXP Edition is the low-cost upgrade for the popular LPCXpresso IDE featuring higher download limits, support for a wider range of LPC parts, and additional functionality over the free product. Available in 256k or 512k versions (128k version FREE), Red Suite 4 NXP Edition is based on an enhanced version of the highly integrated software development environment found in the LPCXpresso IDE, and includes all the tools necessary to develop high quality software solutions in a timely and cost effective fashion. The Red Suite IDE is based on the highly popular Eclipse platform and features many ease-of-use and Microcontroller specific enhancements. Red Suite includes the industry standard GNU tools enabling professional quality tools at low cost. The fully featured debugger supports both SWD and JTAG debugging, and features direct download to on-chip flash. Red Suite 4 NXP Edition is a significant upgrade over previous releases and includes support for Cortex-M4 based processors and new compilers and libraries which further reducing target code size. This release includes support for the new LPC1800 and LPC4300 MCUs from NXP. The Red Suite Integrated Development Environment (IDE) provides a C/C++ programming environment second to none, with syntax-coloring, source formatting, function folding, online and offline integrated help, extensive project management automation and integrated source repository support (CVS integrated or Subversion via download). * User extensible Wizards for creating embedded applications complete with startup code and linker scripts correctly configured for target MCU. * No assembler required with Cortex-M based devices, even for start-up code and interrupt handlers. The peripheral viewer provides complete visibility of all registers and bit-fields in all target peripherals in a simple tree-structured display. A powerful processor-register viewer is provided that gives access to all processors register and provides smart formatting for complex registers such as flags and status registers. The download includes a "Redlib", a small footprint embedded C library, and a "Newlib", a industry standard fully featured C library.